Gamlebyen in Fredrikstad was built as a military stronghold to defend Norway from the advancing Swedish army 440 years ago. Since then civilians and military personnel have lived side by side here mutually depending on each other. They have left some impressive monuments through the last 200 years. 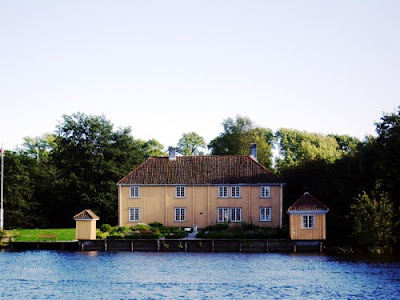 As many Norwegian cities, most of the houses in Gamlebyen were constructed in wood. Most of the buildings built in the earliest part of the period burned down in several fires that raged the city. 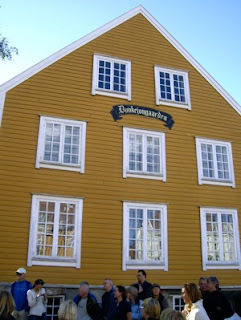 Today the oldest wooden houses in Gamlebyen dates back to the last half of the 18th century. Many of the largest and oldest houses are found around the Central Market square. Here you find this impressive ochre building. It is one of the oldest wooden buildings in the city, dating back to the time of the French revolution. The name is much younger. It is derived from Dunke John (Barrel John) alias John Larsen that lived in the house in 1860. He was a merchant in Fredrikstad and had moved to the city as a trader. And he sold hard liquor from barrels he stored in the basement of the house. He did not live here alone. It was big enough to house two other families. The house is now owned by the Ministry of Defence. This beautiful neo-classic building was built during the last decades of the 18th century. 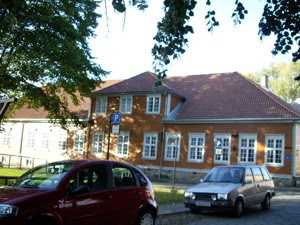 It was extended in 1837 to house Vennehåbet a local club that stayed here until 1913. Today it is the Masonic temple. It is now the home of the St. Magnus lodge. 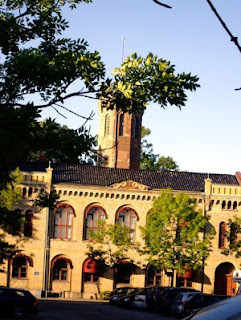 This beautiful neo-roman building is designed by Emil Victor Langlet, a Swedish architect. The house was built on this site after a fire in 1858 where two old wooden houses burned down. Langlet is more famous for another building. He designed the Norwegian Parliament building, and it was actually built on the same time as the City Hall, in the mid 1860s. It has many of features found in the parliament building. It is constructed in yellow bricks and many of the details are found in both buildings. The arched windows and medieval-like features. Enjoy Food & Travel - your hotel site!